To all of you who have been waiting to see this project, thanks for hanging in there and enduring the teasers on social media. But then he told me he loved art and trusted my creative instincts, and I knew we would be a great team. This was the first thing I saw when I walked into the house, and my jaw about hit the floor. I’ve never seen anything like it. This DIY lighting plan (done before my client bought the house) felt like a pendant attack. Then there was no other lighting in the entire great room. 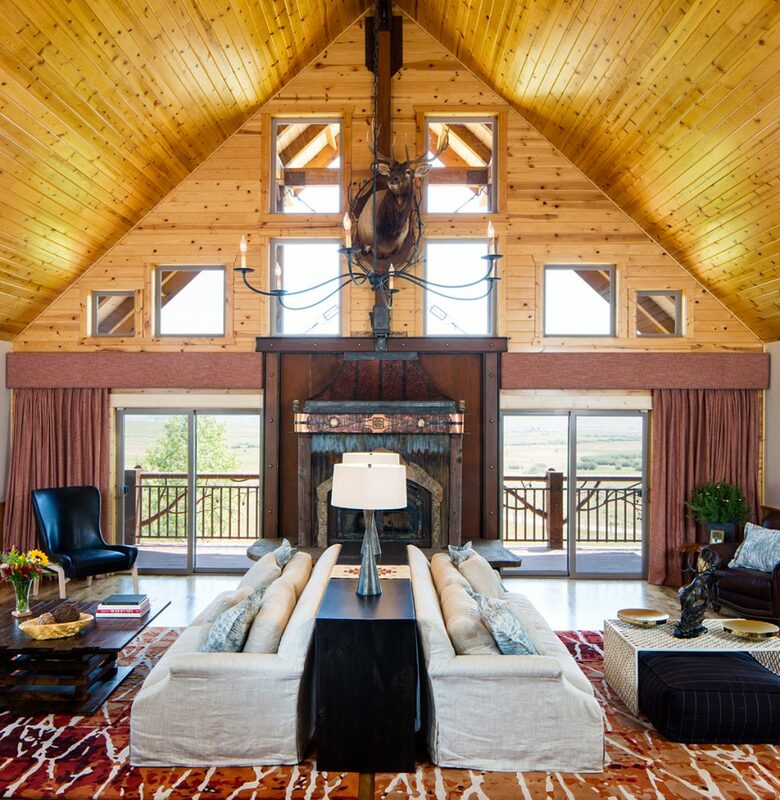 Although it was an open floor plan, it was split down the middle with an uneven portion of wood and carpet. It defined the room in the strangest way. The room had bulky leather chairs (with nailheads, of course) and anything you might imagine in a typical cabin. A bunch of men were handling the end details, and even though my client said he liked clean lines, the house was headed in the opposite direction. Luckily the cabinets weren’t crazy, so we left them untouched. We took up the floor and replaced it with wood everywhere so there weren’t any strange partitions. 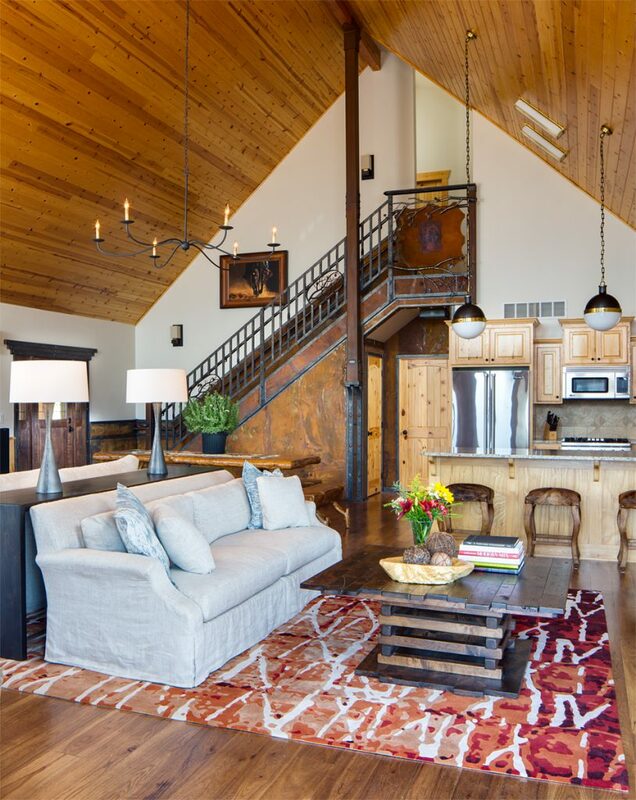 We chose a hickory floor for its ability to take a beating (you come to Wyoming to enjoy the great outdoors). That opened up my furniture options. A double sofa layout ended up being the perfect way to fill the room, which was wider than it was deep. 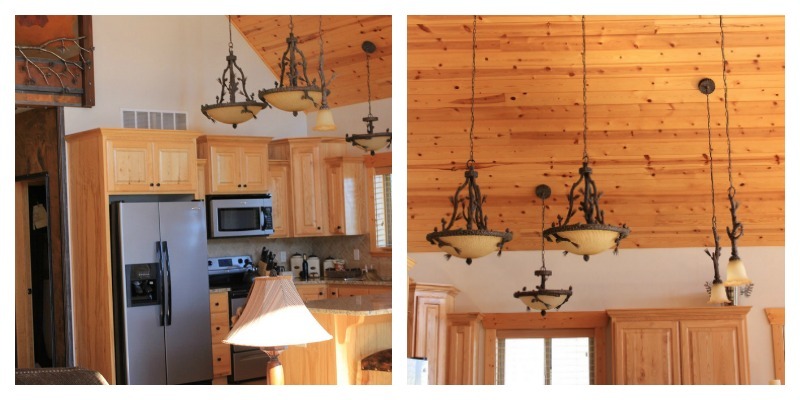 We made use of an existing floor outlet to bring more lighting into the center of the room and hung a simple chandelier. It had to have simple lines, and I think we found the perfect one. We also updated the appliances. Before I came on the job, there was a weird corner cabinet used for the television. I ripped it out so we could get more symmetry in the room, and then we started the furniture design with some amazing custom rugs. Every color that went into them was hand-picked. I feel like they make the room interesting and decades younger. Then I softened up all of the wood with custom cornices and curtains. What a difference they make! The light sofas allowed me to push the values in the room. 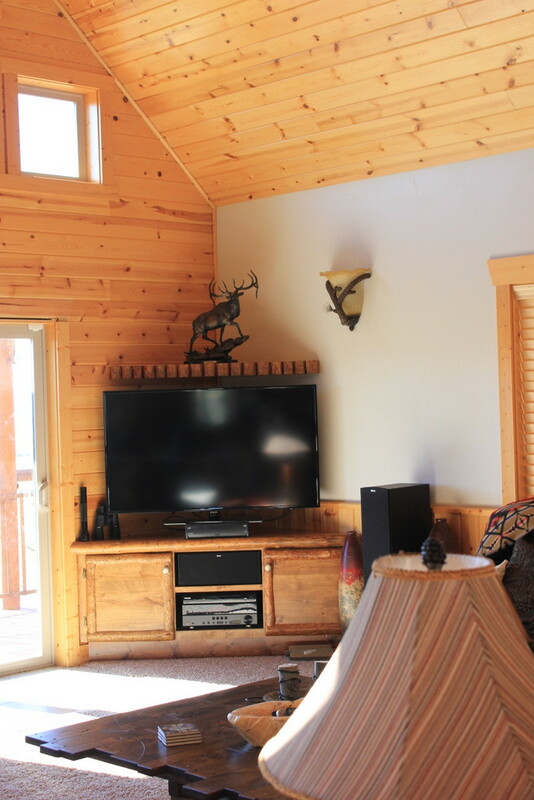 Have you ever noticed houses or cabins with tons of wood are really dark? We had to pull light colors in the room to counteract the heaviness. 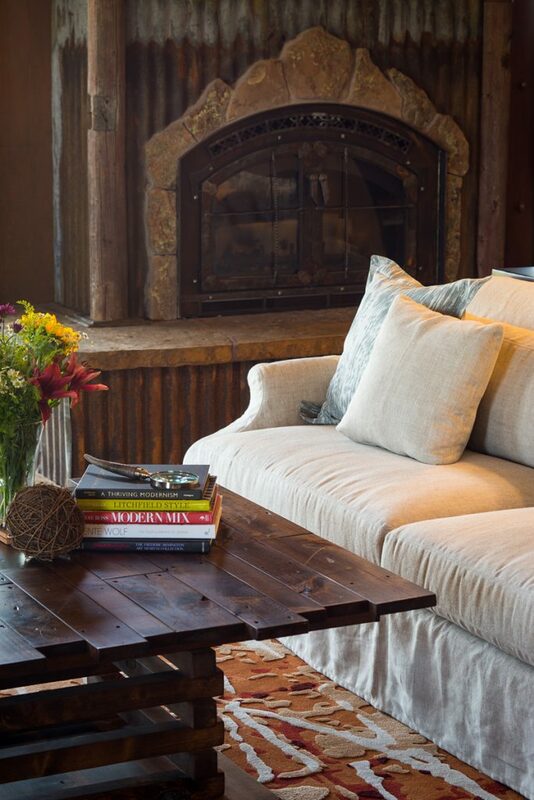 Here’s a vignette in the great room. The cupboard was previously owned by my client. We used as many pieces as we could that he had already purchased. The red worked perfectly, and it also stores extra dishes that don’t fit in the kitchen. 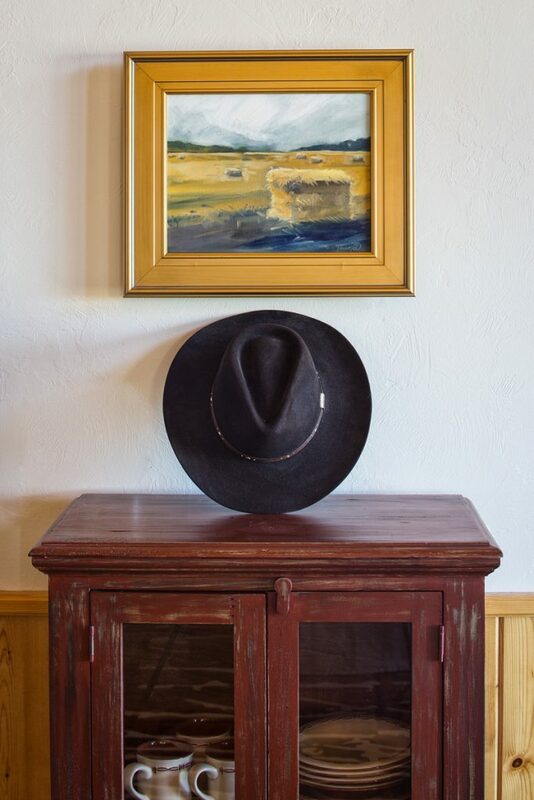 The haystack painting is one I did a few years ago, and I’m so happy that I found its perfect resting place. We ran into another crazy issue in this cabin: the laundry closet. There was only an ill-fitting curtain hiding an old, side-by-side washer and dryer. 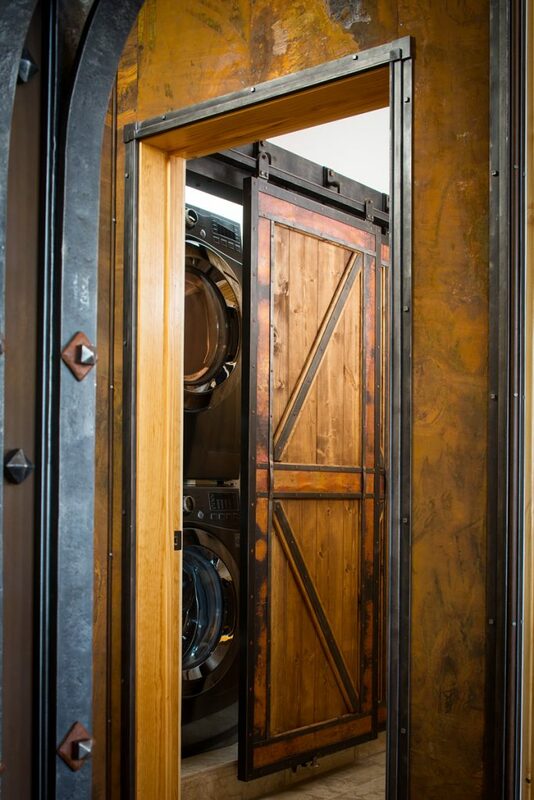 We couldn’t put regular doors in the area because of congestion, but I designed custom barn doors with an expert metalsmith that slid past each other. What a difference it made! Last but not least, I tackled the powder room. It wasn’t horrible. It was just a little vanilla compared to the rest of the house. 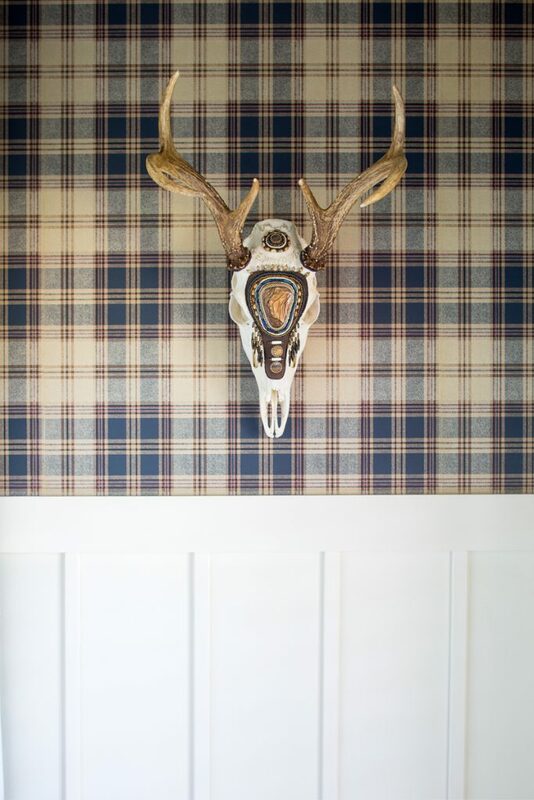 This is where the creative juices went into full swing, and my client again trusted me when I proposed plaid wallpaper and a beaded skull by the talented Rene Gibson. I’m so appreciative of the trust clients give when I’m working on their homes. When we are given that gift, I think our work takes on a higher level than ever imagined. This cabin still kept its roots. It doesn’t feel like we tried to turn it into something it wasn’t, but we cleaned it up and reinterpreted what a traditional cabin can be. My client was thrilled and will get to enjoy this stunning location for years to come. 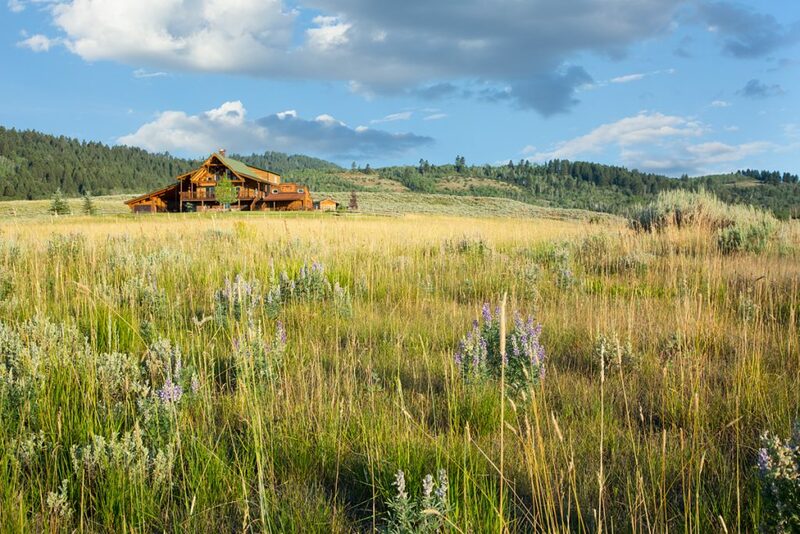 Thanks to Paul Richer for photographing the spirit of the cabin. It wasn’t easy! Until next time friends! Beautiful job! 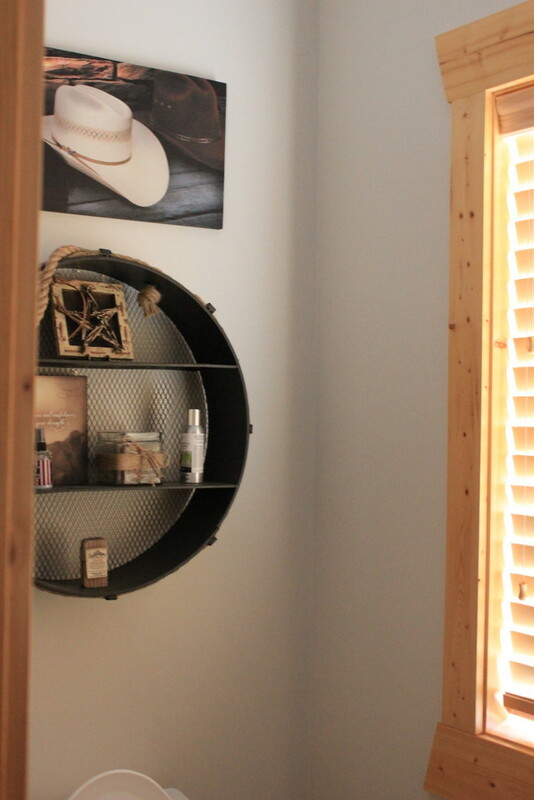 Loving the custom barn door! SO fun to finally see it!! Great work! What a difference.